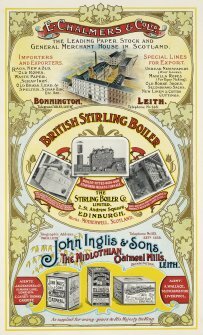 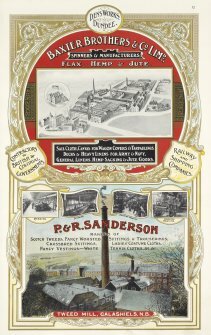 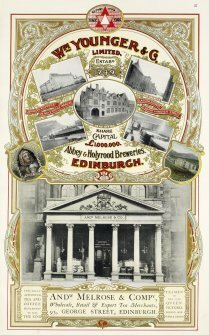 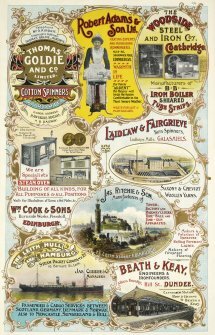 The RCAHMS National Collection includes a wealth of material relating to Scotland's places, including historic books illustrating buildings and industrial sites. 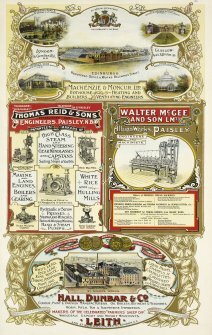 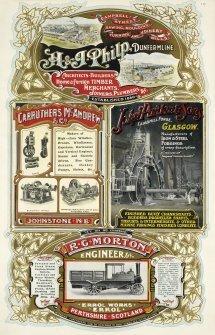 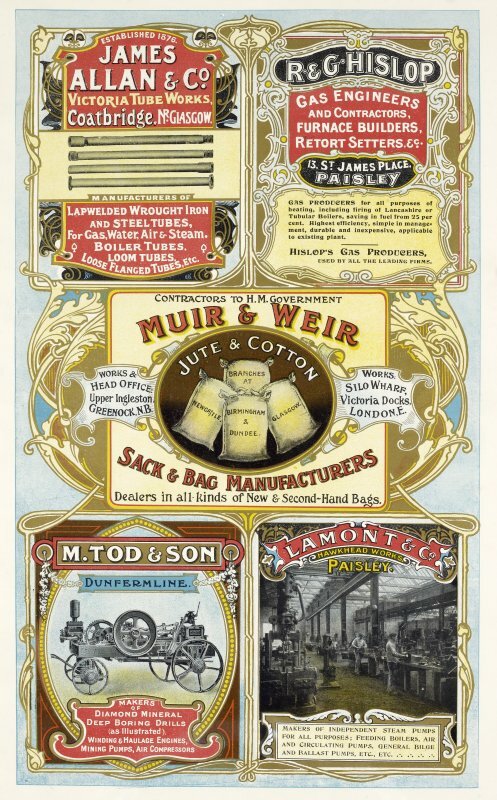 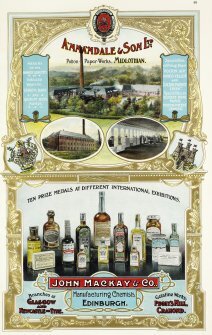 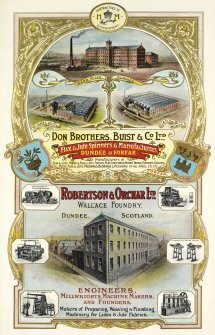 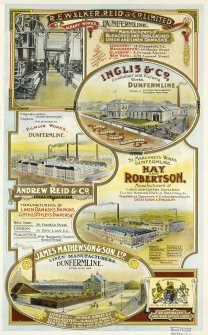 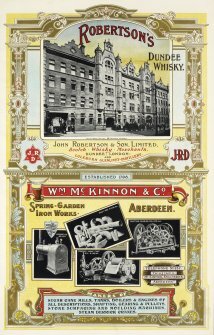 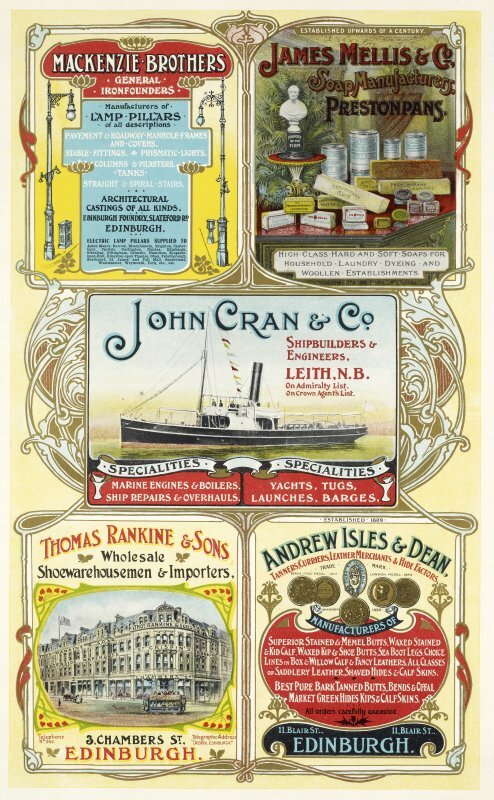 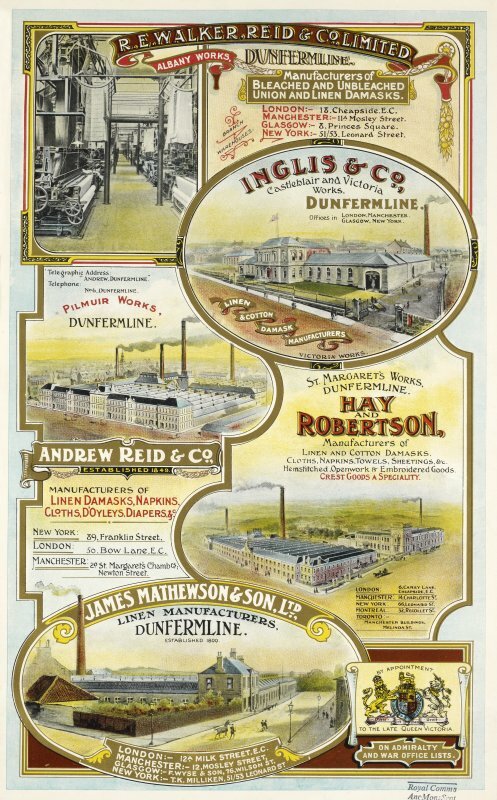 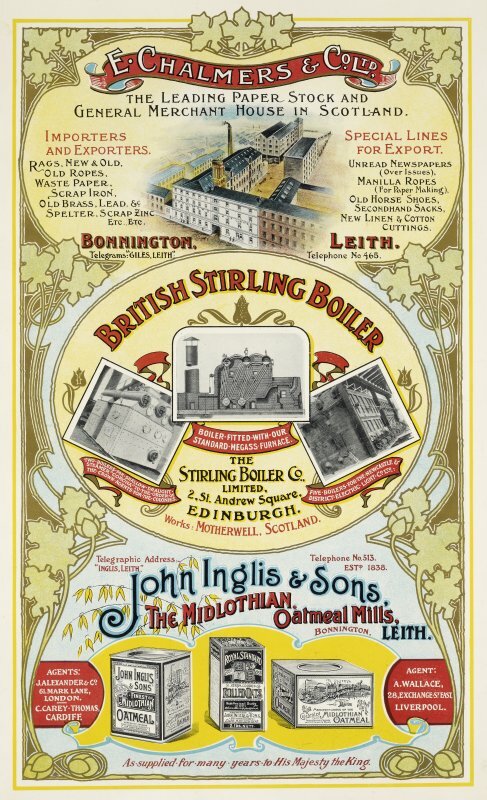 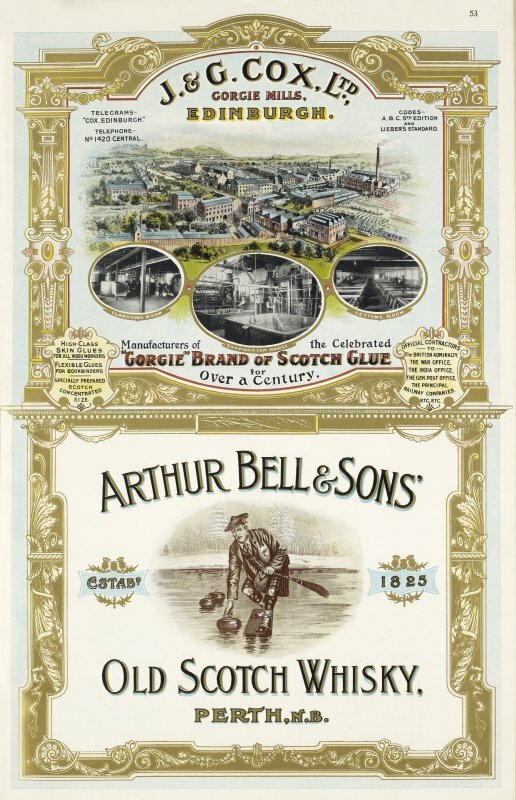 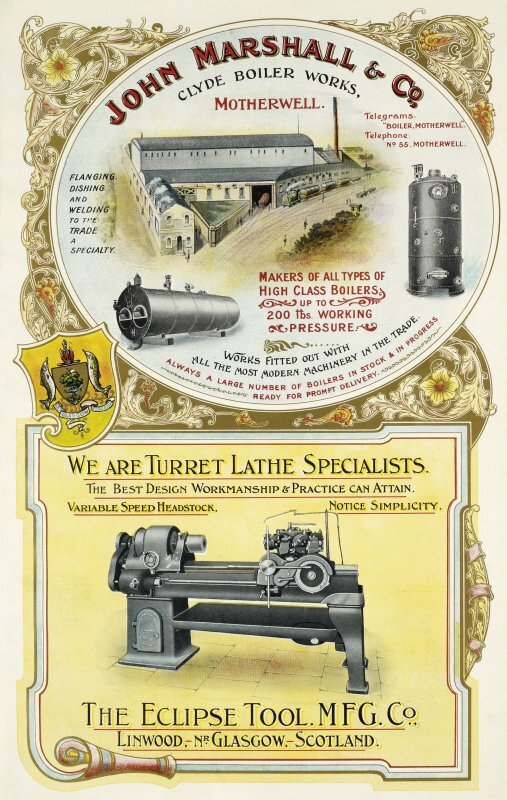 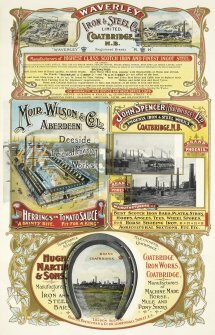 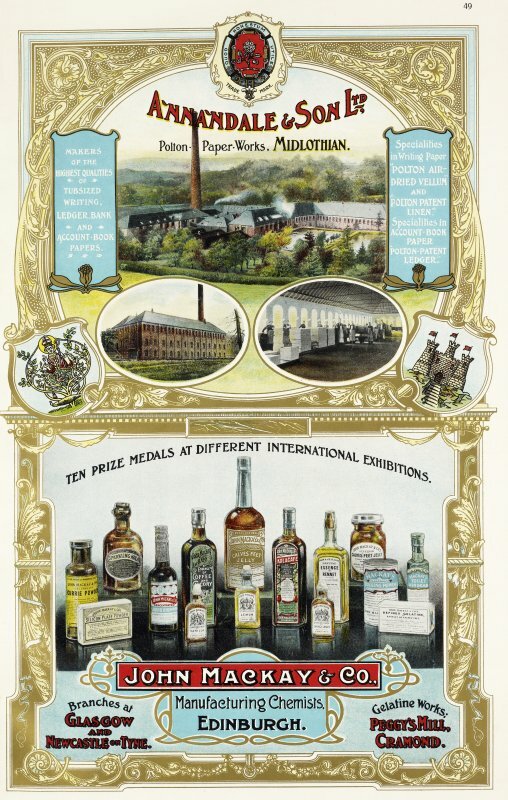 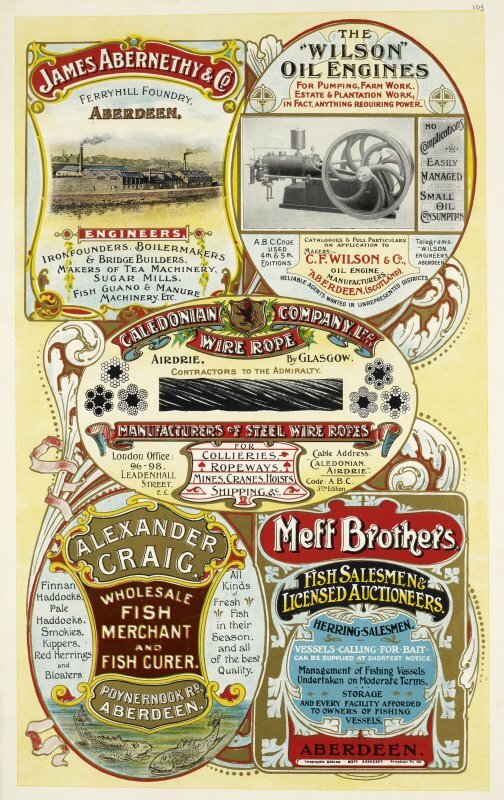 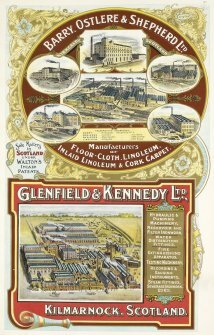 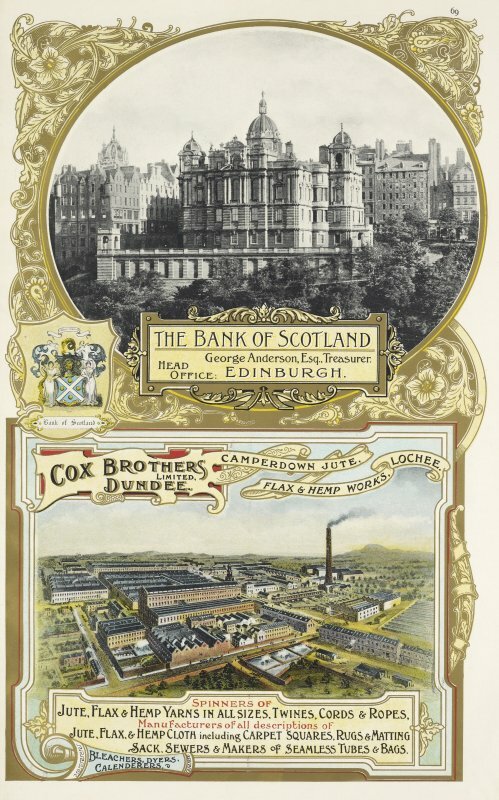 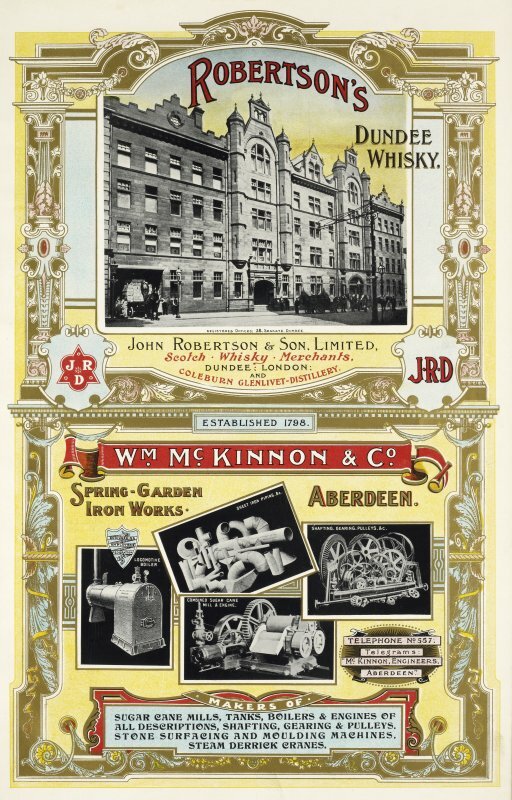 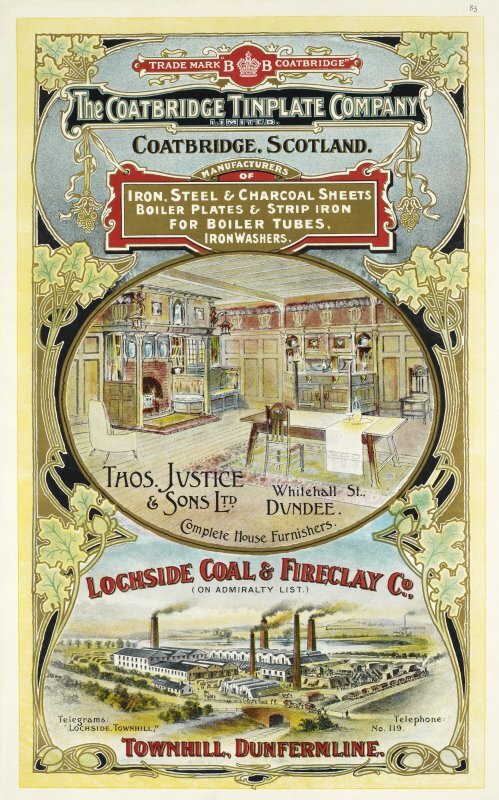 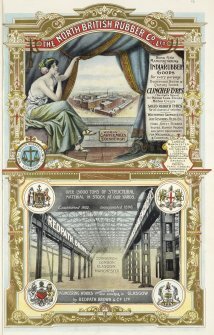 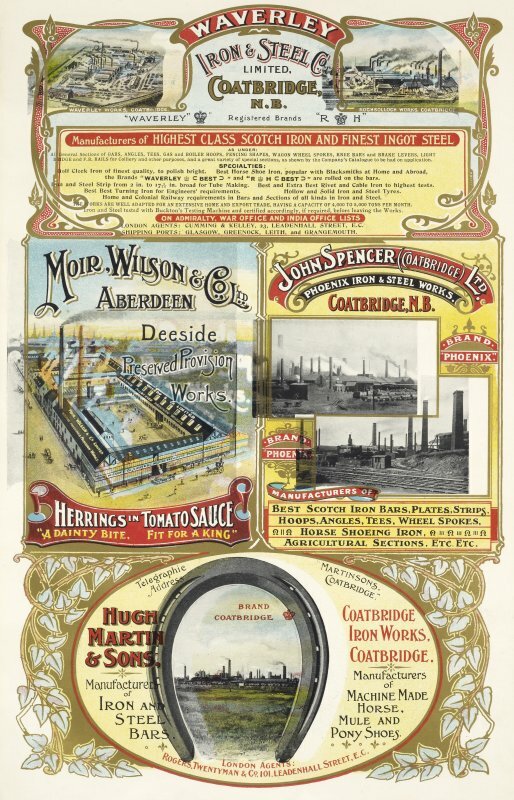 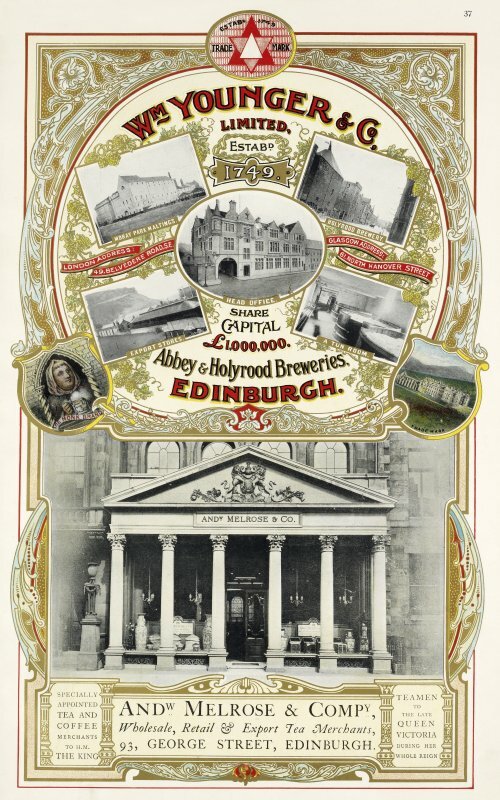 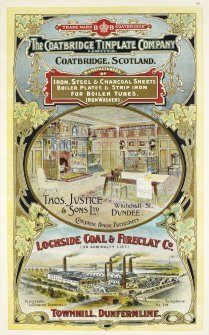 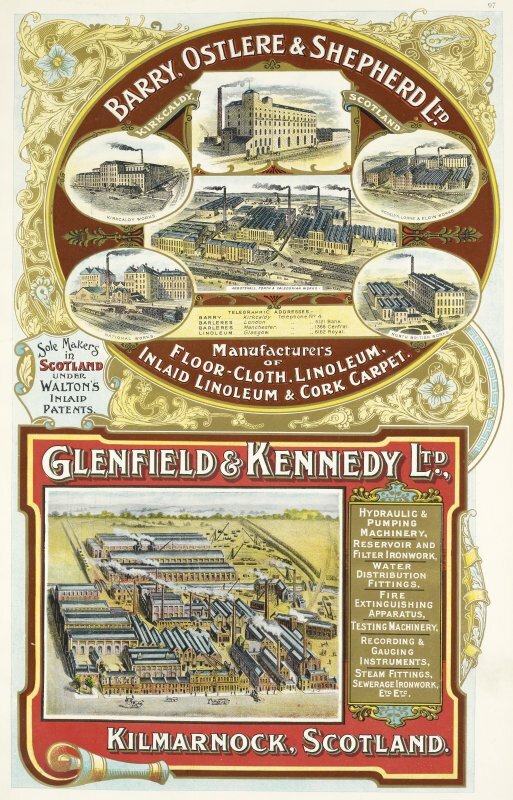 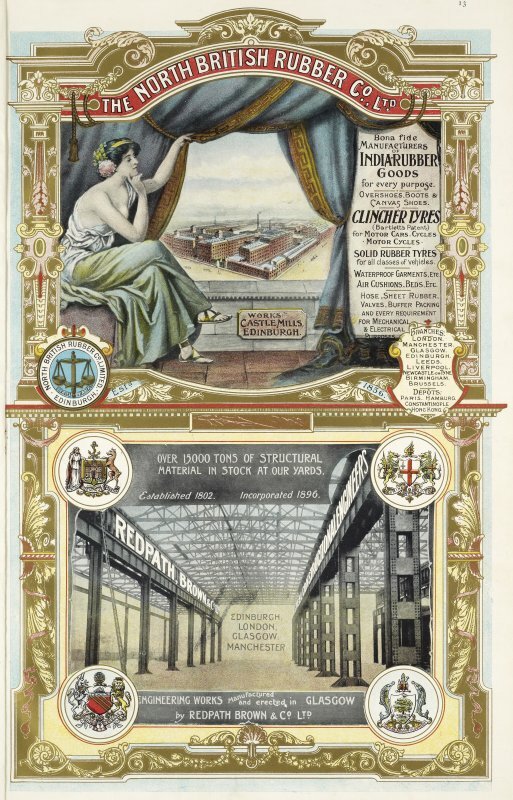 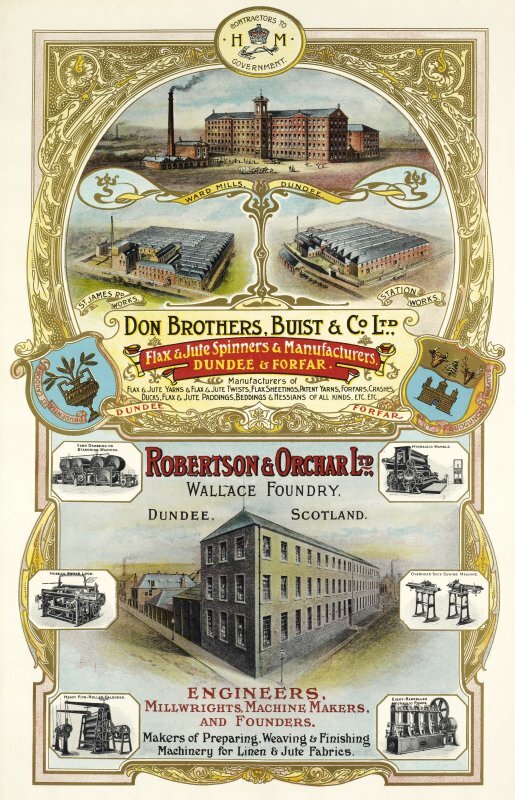 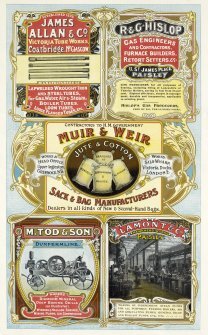 This gallery features colourful advertisements from Scotland's Industrial Souvenir volume 2, a trade catalogue from 1905 which highlights Scotland's industrial achievements. In addition to the adverts it features articles on different industries in several Scottish towns and cities. 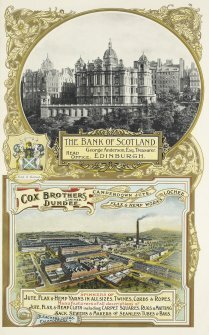 The publication was in 'universal circulation' to promote Scotland's Industry and copies were sent to the Chambers of Commerce in Great Britain and every part of the world, the British Consuls and Consular Officers, the British Embassies, the Boards of Trade in British North America and 'over 6000 other addresses'. 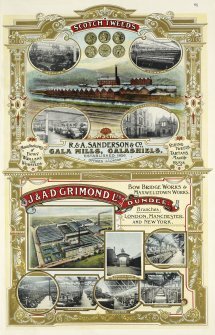 Copies were also distributed to the waiting rooms of the Midland Railway Company and the Glasgow & South Western Railway Company as well as on the passenger vessels of the Cunard SS Line, the Natal SS Line, the Aberdeen SS Line and the Japan Mail SS Line. 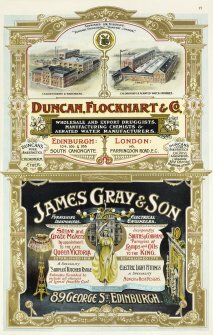 It was published and printed by Bemrose & Sons Ltd, Derby & London, with Alan J Woodward as editor. 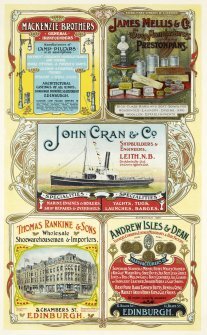 This publication can be consulted in the RCAHMS Search Room together with our extensive collection of historic books, photographs, drawings and information. 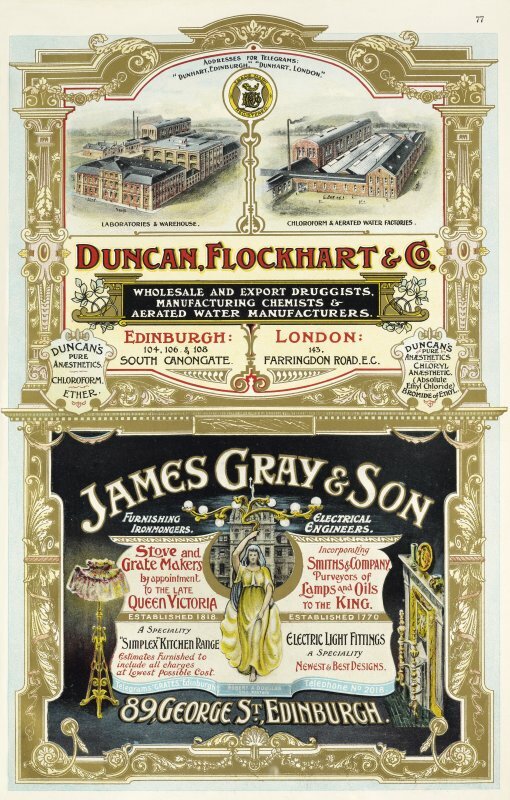 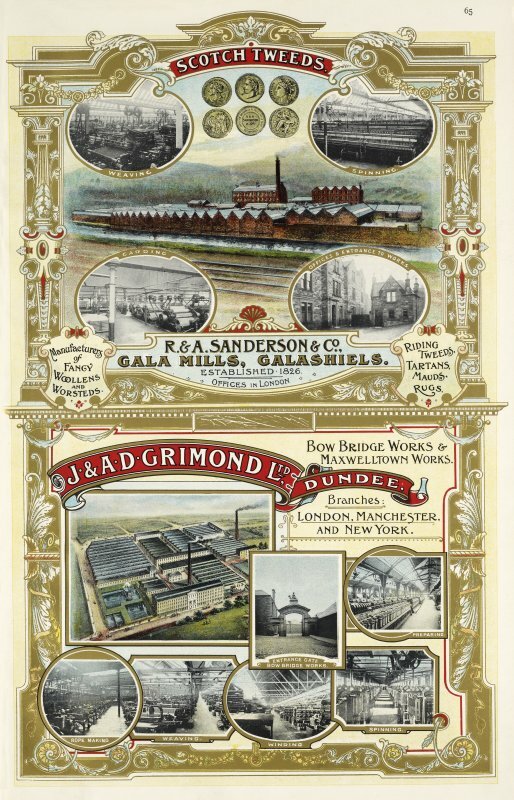 Advertisement for R & A. Sanderson & Co. Gala Mills, Galashiels and J & A. D. Grimond Ltd, Bow Bridge Works and Maxwellton Works, Dundee. 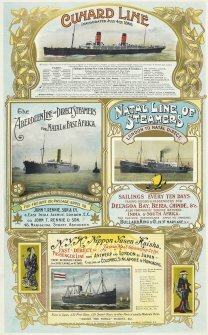 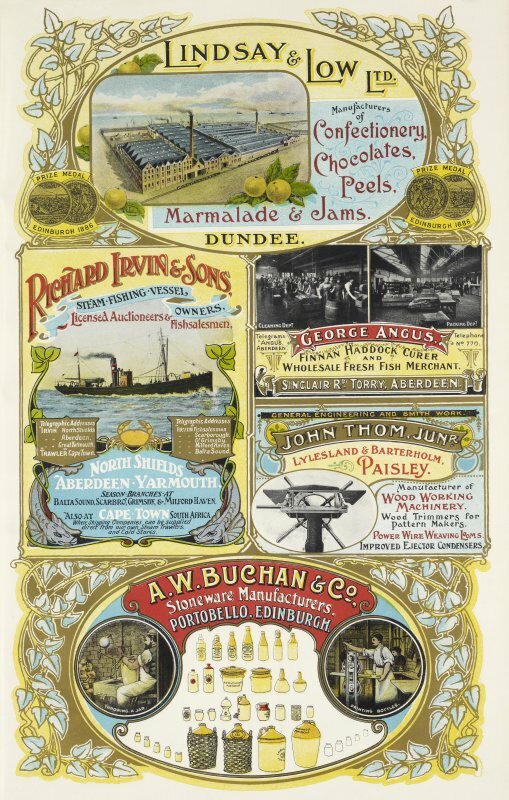 Advertisement for the Cunard Line, The Aberdeen Line of Direct Steamers for Natal and East Africa, the Natal Line of Steamers and Japan Mail Steamship Co Ltd.
Advertisement for The Bank of Scotland, Edinburgh and Cox Brothers Ltd, Camperdown Jute, Flat and Hemp works, Lochee. 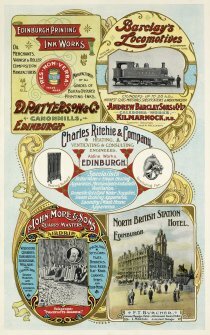 Advertisement for the North British Rubber Co. Ltd, Edinburgh and Redpath Brown & Co. Ltd, Glasgow. 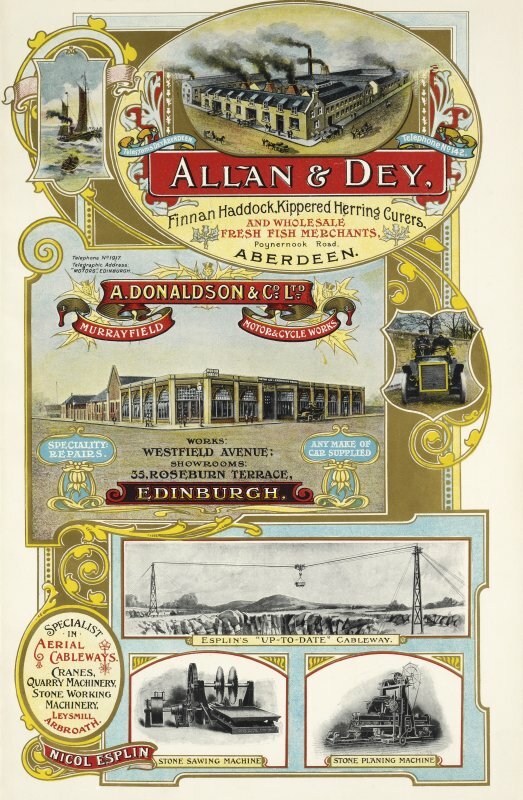 Advertisement for Allan & Dey, Finnan Haddock, Kippered Herring Curers, Aberdeen; A. Donalson & Co. Ltd, Motor and Cycle Works, Edinburgh; and Nicol Esplin, Specialists in Aerial Cableways, Arbroath. 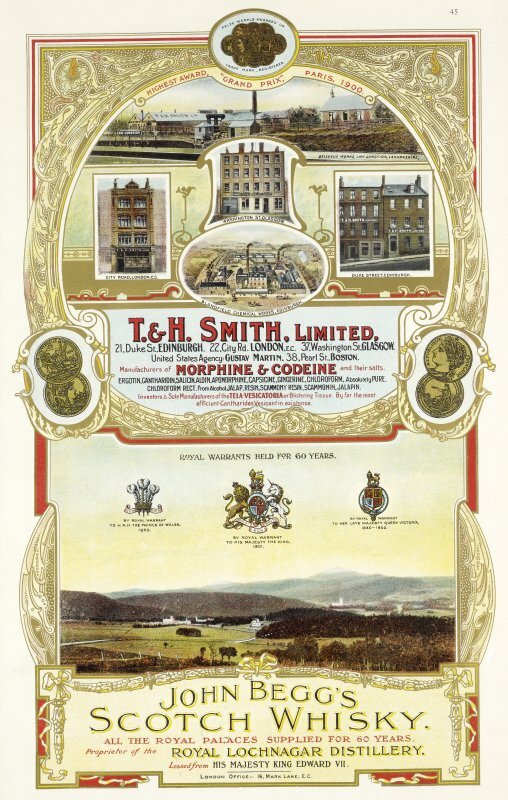 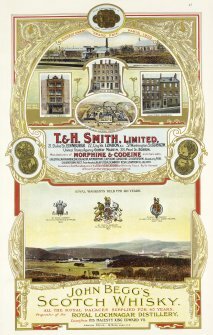 Advertisement for T & H Smith, manufacturers of morphine and codeine; and John Begg's Scotch Whisky. 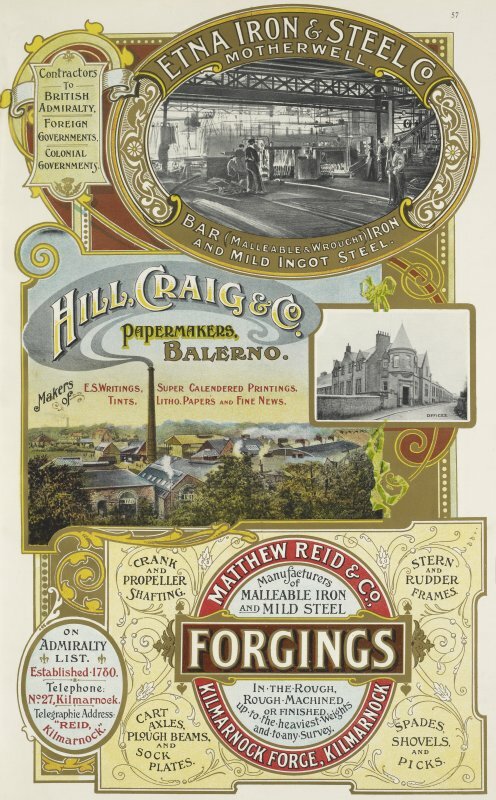 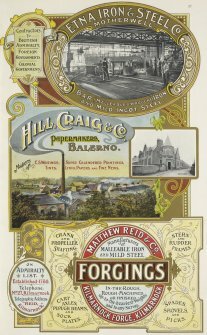 Advertisement for Etna Iron & Steel Co, Motherwell; Hill, Craig & Co papermakers, Balerno and Matthew Reid & Co Forgings, Kilmarnock. 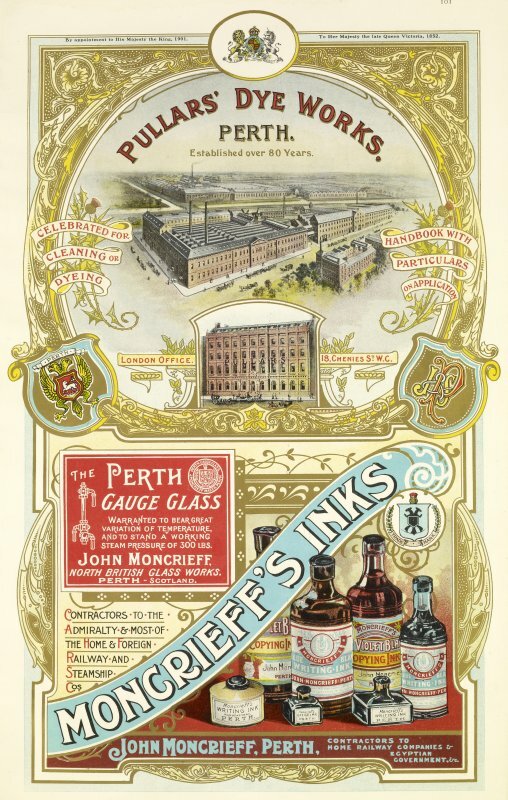 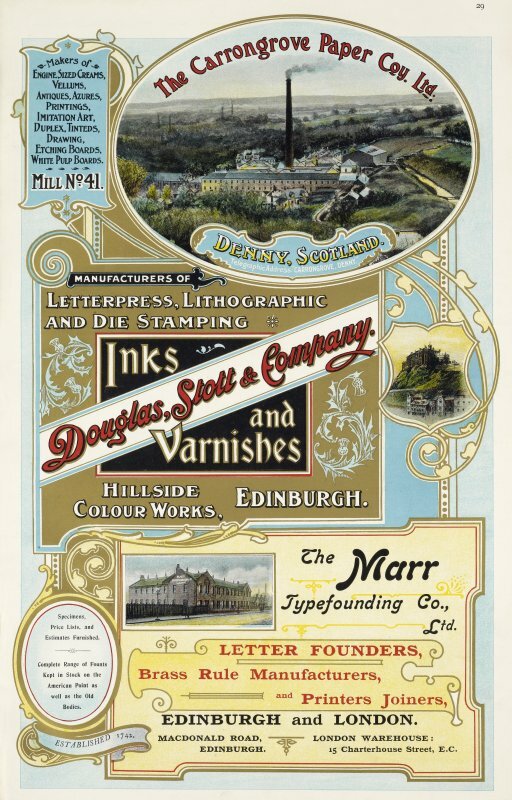 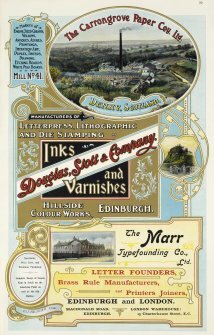 Advertisement for Pullar's Dye Works, Perth and Moncrieff's Inks, Perth. Advertisement for Archd. 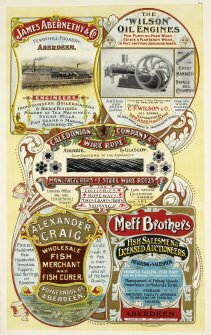 Aikman & Co Ltd, Wine Merchants, Edinburgh and Alexr. 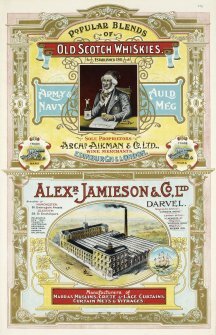 Jamieson & Co Ltd, Darvel. 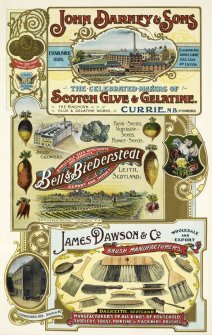 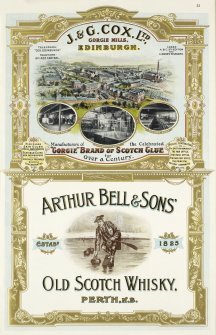 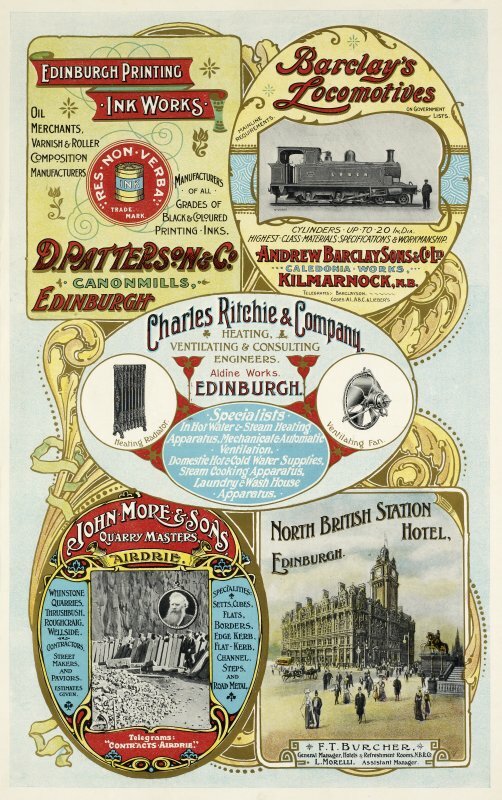 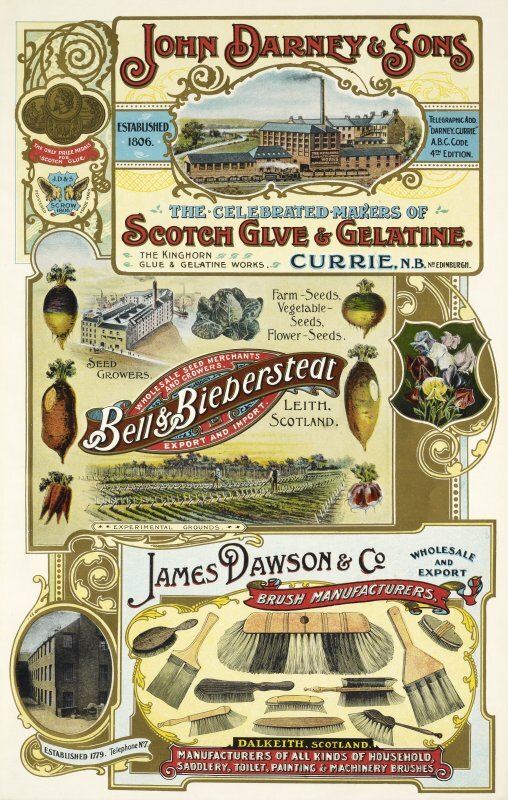 Advertisement for John Darney & Sons, Bell, Glue and Gelatine Works, Currie; Bell & Bieberstedt, Wholesale Seed Merchants and Growers, Leith; and James Dawson & Co, Dalkeith.